Holder for rod storage system Kenovo DuraTrax. Used for rods (SHVHR1, SHVHR2, SHVHR3). Mounted in the bracket SHVBR1. Attached to the bracket using SHVBR1 holder SHVRH. 400 mm bracket for mounting shelves (SHVP1, SHVP2, SHVP3, SHVP4) hung on vertical strip (SHVWS1, SHVWS2, SHVWS3, SHVWS4). Mounting block is used as the base substrate for attaching small hooks (type GSH21, GSH22) storage Kenovo DuraTrax (without rail). Mounting block is used as the basis for fixing the single elements of the storage system Kenovo DuraTrax (without rack). 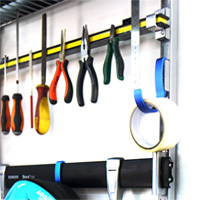 Universal strap mounting for hanging objects weighing less than 50 kg. Mounting roof box for car. Mounting on the rail (GSR1, GSR3, GSR6). Mounting on a single mounting unit (GSR2). Designed for rail mounting (GSR1, GSR3, GSR6) on wall strip (SHVWS2, SHVWS3, SHVWS4) for Kenovo DuraTrax. Mounting on wall strip (SHVWS2, SHVWS3, SHVWS4).